Look, let’s get right to it. It’s December, the season of giving and receiving – but more importantly giving. Don’t be the person who shows up to the holiday party empty handed or the one who let’s down your favorite tech savvy relative. We here at New Horizons Computer Learning Centers consider ourselves Computer Geeks in the best sense of the word. So we thought it appropriate to share our list of most-wanted gifts on our wish lists this holiday season. Read on and then let us know what you're wishing for this year in the comments section. 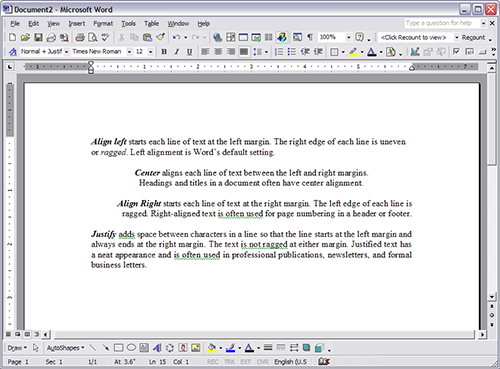 There are many ways to change the alignment of a paragraph in Microsoft Office: you can click the Align Left, Center, Align Right, or Justify buttons on the Formatting toolbar (the Home tab's Paragraph group in Word 2007 and 2010); you can also select Format | Paragraph, click on the Indents And Spacing tab, and choose the desired setting from the Alignment dropdown list. The order of deny and permit statements has a major impact on how Cisco IOS interprets IP access lists. For this reason, it's helpful to have a way to easily control the order of lines and insert a line in a given position without having to rewrite the entire list. GUEST BLOGGER: Brian Parker, Technical Instructor.